Ladybirds believed to be carrying a dangerous sexually-transmitted infection that have arrived in Britain from Asia and North America are now invading UK homes. 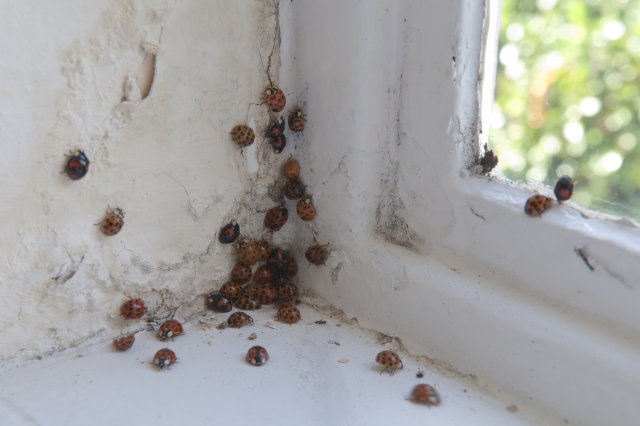 One mum has told of how her Essex home was covered in the giant Harlequin ladybirds. Lisa Rump, 37, from Harlow, told The Sun: "I'd just pulled up on the driveway and my house was covered in hundreds of them. "Now it's worse. There's swarms of them flying around and covering the windows and walls." She added: "They are larger than normal ladybirds, some yellow, some red and some with loads of dots or just a few." The insects are thought to have arrived on mild autumn winds and are a threat to domestic species of ladybirds because they carry an STD called Laboulbeniales fungal disease. They seek hibernation spots in homes and have been found around boilers and window frames. Duane Richards, from Holm Fen, near Peterborough, told the Daily Mirror that scores of the insects were found on her car. And Andrea Allen, who lives in Hazel Grove, Stockport, told the newspaper that saw "hundreds if not thousands" on the trees in Torkington Park. While they are not a direct threat to humans, they can damage furniture. A spokesperson for the Buglife nature charity told International Business Times UK: "Large gatherings of them can give off a chemical smell and in centrally-heated houses they may be woken up from hibernation by the warmth and fly around the house." The Harlequin Ladybird Survey said: "When hungry, harlequin ladybirds will bite humans in their search for something edible. Ladybirds in houses, woken from dormancy by central heating, may bite people as there is no food available."